Holy Crap! A New Website! It has been 4 or 5 years since my last website went live. It was right when I opened my studio and if I am being real I had no idea really how the studio or the changes it would bring should be translated into that site. It was really a site for me, a freelance creative to get work. it wasn't ever what it really needed to be to get the right messaging across. I have honestly had some form of my new site designed for over 2 years. Always trying to perfect it, make it "ready" for launch. The creative curse. We always want it perfect so it can never be done. I am a master of that skill and it is one I am working on breaking. The next step for me was how the hell do I get the thing made? I had left my dev skills behind years ago. Sure I know enough to talk the talk but really I am in no place to actually build a full site anymore from the ground up. So begins the quest. Who, what, how to build the site? First stop was my friends at New Media Campaigns who built my previous site and just crushed it. I had been working with them for year as a design contractor and they were also integral in helping open the studio. But as I started to grow the studio and they grew their team we parted ways and I knew they were so busy with current projects that this would not (and should not) be on the forefront of their list. Then I started looking at returning to my dev roots and playing around with Wordpress. Knowing that I would not be able to get it done from scratch I was looking at Wordpress based builders like Divi, Elementor and others. But there was just too much of a learning curve for me still. Too many barriers for me to be able to dive in and out as needed to wrap it up while also doing client work. I had a wonderful selfless offer from my friend Patrick Hill of the fantastic Masters of One podcast. He would build my site for me. For free. Amazing offer. But in the end I knew I had to figure out a way to do this myself. Knowing I would need to have the ability make many changes, various page templates and other tweaks as I figured out what my remessaging and reprioritizing needed to maximize the effectiveness of the new site. I had decided on two options. Squarespace and Webflow. Having used Squarespace in the past I knew it would get the job done but the old web designer in me just couldn't let this go without it being a statement from me. Something that stands out and isn't just another templated site. I had this great design (I think at least and it's my site so there) So I started to look into Webflow and with my previous dev background and the amazing tutorials and community surrounding it Webflow just clicked for me. It was like I had always been using it. I was able to translate my design pixel for pixel. Perfectly. In fact, I was able to make improvement and iterations without going back to my design tools. 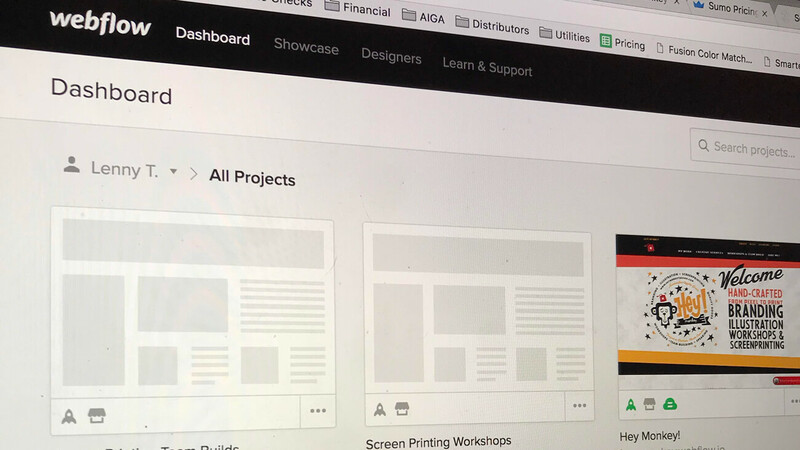 Webflow made the prototyping and refinement process that easy. Webflow just clicked for me. It was like I had always been using it. Along the way, as easy and dare I say as FUN as Webflow made designing my site it also reopened the door to the possibility of doing web design for my clients again. The design, dev, hosting, content management and front-end editor capabilities, this is a near perfect system for most small business websites. I can honestly say it was truly a pleasure to design and build my new site in Webflow. This is not a paid post in anyway. I just think Webflow is rewriting the story in making custom web design even more accessible to everyone.